Sanctions Are Lifting, But Iranians Are Still Waiting For The Benefits : Parallels Iranians were promised that a nuclear deal would lead to an economic boost as sanctions vanished. But as the country votes for a new parliament on Friday, there's been no economic upturn. 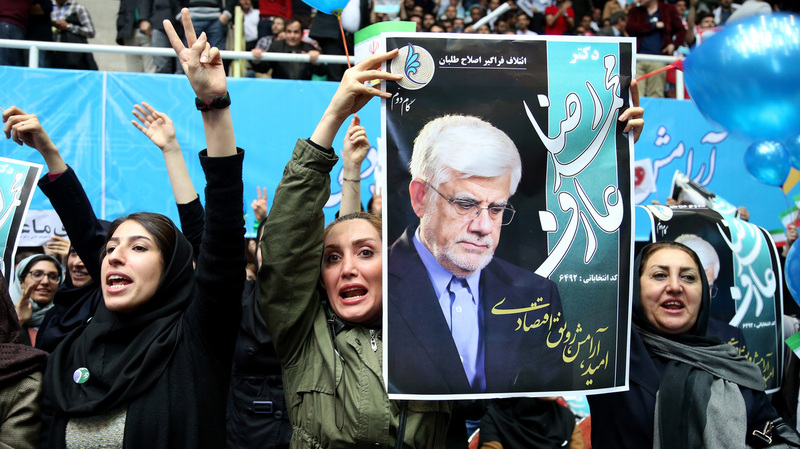 Iranian women chant support for Mohammad Reza Aref, a reformist candidate in Friday's parliamentary election. This is the first election since Iran signed a nuclear deal with world powers last summer, followed by the lifting of many sanctions at the beginning of this year. Iran's capital, Tehran, is in political overdrive this week. Candidates for parliament are battling the Tehran traffic, vying for support in Friday's elections. This is Iran's first ballot since a nuclear agreement last July that brought the lifting of international sanctions in January. Long before the nuclear deal was signed, Iranians were told by their leaders that the removal of sanctions would bring more opportunity and better living standards. But for the most part, ordinary Iranians aren't seeing improvements so far. Taxi driver Arif Turkoshvand talks politics while weaving through the always congested streets. He explains that he always backed the hardliners and ignored those who want to reform the Islamic Revolution he grew up with. But now he's no longer as certain. "In the past few years, people are less interested in ideology," he says. "They're looking for a better life, something real, while parties on all sides seem to only look out for themselves. If I can find someone, a reformer or a hardliner, who will go to parliament and do what the people want, like fixing this terrible traffic, they'll get my vote." However, the Iranian political system is geared to favor the conservatives. The Guardian Council, which approves or nixes potential candidates, has knocked many reformist politicians off the ballot, to the point where reform blocs are recruiting conservative candidates just to fill out their ballot lists. Hardliners, meanwhile, are fighting among themselves because there isn't room for all of them on the conservative blocs. One candidate, Hussein Sheikhol Eslam, is a diplomat who describes himself as a centrist. He says he's not out to undermine President Hassan Rouhani, who's seen as a moderate. But he does think Rouhani made a mistake by promising an almost a magical economic recovery while the nuclear deal was being negotiated. "The big mistake he made, he [told] people that the economy will start flourishing as soon as the deal is signed," he says. "This wasn't wise. From the beginning, he put all of his investment in this deal." Rouhani will face re-election next year and faces the challenge of delivering economic growth to people at street level, not just the business elites. And to get a parliament he can work with, Rouhani needs a big turnout by moderate and reform voters, to offset the number of extreme hardliners in the legislature. But the lack of visible economic upturn makes it that much harder to count on an enthusiastic turnout by reformers. In one of Tehran's many urban parks, aviaries of brightly colored birds give a tropical soundtrack to the couples chatting on benches. Here, an Iranian journalist agrees to discuss the mood of the voters if we use only her first name, Sheva. She says people want to believe parliament can help Rouhani boost the economy, but they're far from convinced. "People do hope that the parliament can help turn things around," she says. "Unfortunately, up to now, parliaments have not done a very good job at all. So people in Iran are living on hope. But they need more than hope from the parliament." The candidates keep crisscrossing the city, racing through this one-week campaign season in hopes of convincing voters that this parliament will actually make a difference in their lives.